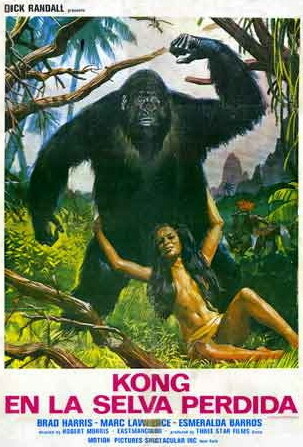 You'll have to excuse me because I may have gotten this confused with Bride of the Gorilla, which I watched afterward. I think this was the one in color? Some guy has to save some girl from some guy. I think the guys are mercenaries. The "kong" part comes from some guys in gorilla suits. They are really bad suits, and I kept thinking that the evil scientist, rather than controlling actual gorillas, was brainwashing guys into wearing gorilla suits and doing his bidding. It's all done through radio waves emitted from a single red lightbulb, which is hilarious to me, a man living in the 2000s.. The only other thing that happens in this movie: people are trying to track down, or alternately, avoid coming into contact with, the "sacred monkey" which is just some girl in a "native" skirt. The only thing good about this movie is the fact that every character, except the Sacred Monkey, is vile. No one cares about anything except themselves, and I get a kick out of this. Even the hero is abominable. When he isn't saving girls for money, he's taking long baths stripped to the waist. He only agrees to save his girlfriend from the evil Kongs when her father pleads with him, offering a huge reward. I was honestly quite shocked, because these kind of sociopaths typically only exist in Italian exploitation cinema. Imagine my delight when I found out this is an Italian movie! So there you have it. A movie called Kong Island, that has neither King Kong nor islands, and is full of crazy people. Not really worth watching unless you've got nothing to do.